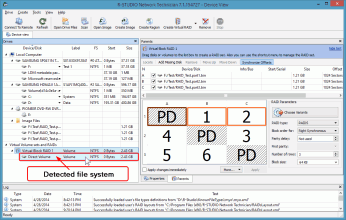 R-Studio enables you to recover data from a failed RAID by creating a virtual RAID. Once a virtual RAID is mounted, R-Studio can recover data from the volume using the same powerful data recovery technology that is used on other disks and volumes. However, the challenge lies in constructing a valid virtual RAID from its constituent disks. Although you may have the correct disks (either physical drives or images) for the RAID, you may not immediately know the parameters for the RAID volume being recovered. Choosing the correct RAID parameters is crucial to successfully mounting the virtual RAID, and therefore it is essential to a successful RAID data recovery. Oftentimes, RAID parameters may be ambiguous or completely unknown. 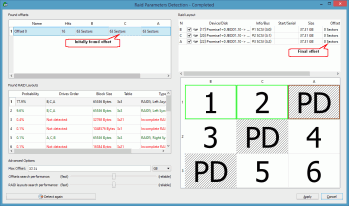 There are some methods for manually finding RAID parameters (see the article "Finding RAID Parameters"), but manual RAID parameter detection requires a good understanding of RAID technology, file system features and other technical concepts. 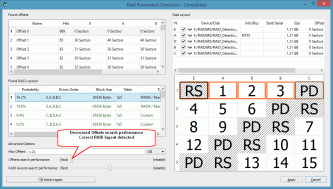 This makes finding RAID parameters very challenging, even for professional R-Studio users. To help with this task, R-Studio has introduced its own unique technology for automatic RAID parameter detection. Using it, R-Studio can detect RAID parameters for any file system on a RAID volume, even if the RAID parameters are completely unknown to the user. Utilizing this technology does not require technical expertise about RAID volumes, but understanding a few key software principles about R-Studio's RAID parameter detection will greatly increase your chances of a successful RAID data recovery. In this article, we will cover a few general notes about using R-Studio's automatic RAID detection. Then, we will illustrate these points by walking through an example operation. Lastly, we will address a few additional steps that can be performed to determine RAID configurations for complex data recovery scenarios. Regardless of the data recovery scenario, a few key points should be observed before attempting to automatically detect RAID parameters. All RAID disks or their images must be included in the RAID layout. If even one disk is missing, RAID parameter detection cannot be performed. This is true even if the disk is substituted with a "missing disk” object. The only exception is a spare disk without RAID data; spare disks may be excluded from the RAID layout without impacting the chances for a successful RAID parameter detection. Including spare disks in a virtual RAID layout is optional. As mentioned above, when building a virtual RAID, spare disks are not required for RAID parameter detection. Including them will not increase or decrease your success rate, but they will impact the time required to process the RAID. If you are certain that a disk is a spare disk without any RAID data, you can safely exclude it from your virtual RAID. If you are unsure, include all disks and expect longer processing times. RAID parameter detection may be a very lengthy process, especially for large RAIDs. Some patience will be required. 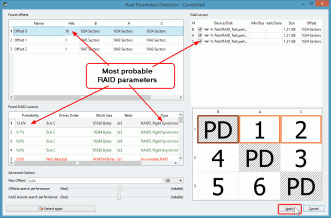 R-Studio shows progress for RAID parameter detection to give you an estimated time to completion. RAID parameter detection may not always be successful. Success depends on many factors. The most important factors are the data types stored on the RAID and the extent of the damage to the volume. Data compression also has an impact: the less the data is compressed, the higher the chances that RAID parameters will be detected correctly. 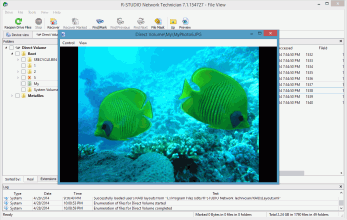 For example, parameters for RAIDs with Microsoft Office or OpenOffice documents, uncompressed images (*.bmp), databases, etc., have greater chances for successful detection than RAIDs with compressed images (*.jpg, *.TIFF, *.png) and videos. Also, residual data from previous RAIDs still remaining on the RAID disks may severely degrade performance of RAID parameter detection. If necessary, the RAID parameter detection operation may be repeated several times. This example illustrates an automatic RAID parameter detection using a simple case. For a scenario like this one, the process is easy and straightforward. These steps presume a basic familiarity with R-Studio's functionality. For further information or guidance, refer to the online R-Studio Help: Finding RAID Parameters. 1. Create a virtual RAID object and add its objects to it. Disregard the disk order, RAID type, block size, etc. Then, click the Auto Detect button. 2. 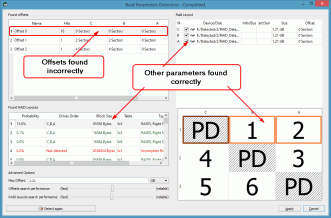 R-Studio will start the automatic detection process, showing its progress. When it finishes, the RAID Parameters Detection - Completed dialog box will show the results. R-Studio will automatically select the best variant found. Please note that in some unusual cases, there may be a difference between the initial and final detected offsets. This is a normal situation and does not affect RAID parameter detection. 3. Click the Apply button on the RAID Parameters Detection - Completed dialog box, and the selected RAID layout will be applied to the virtual RAID. 4. Preview files to verify the correct parameters were detected. 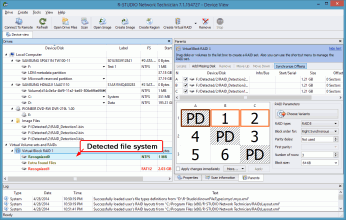 If a valid file system is detected on the RAID, R-Studio will show it. To verify that the correct RAID parameters were detected, you can open the volume and preview some of the files. There are a number of reasons why R-Studio may not detect RAID parameters correctly after the first attempt. In some cases, the data may be damaged too heavily for automatic RAID parameter detection to be possible. But if the data is more or less intact, there are a few techniques that may help R-Studio detect the correct parameters. 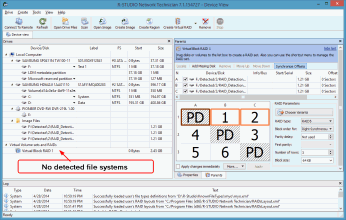 Scanning the Virtual Block RAID may help when R-Studio detects apparently correct RAID parameters, but cannot find a valid file system on the detected RAID. This is especially helpful when the space on the RAID components before the offset is filled with 0s. In this case, R-Studio might detect the offset incorrectly for the first time. When this occurs, R-Studio may not find a valid file system on the RAID. The Virtual Block RAID volume will appear in the Drives pane, but there will be no detected file systems beneath it. In this case, the file system can be found by scanning the RAID. Select the Virtual Block RAID item and click Scan. The detected file systems will be shown beneath the Virtual Block RAID disk. The default RAID detection parameters are calibrated to deliver the most reliable results for the widest range of cases. There are two advanced parameters that can be adjusted as needed: "Offset search performance" and "RAID layout search performance". Adjusting these lowers the threshold for the found offsets or found RAID layouts that are displayed in the results. By default, only the results most likely to be the correct parameters are shown. However, for more complex RAID layouts (for example, RAID 6), the default parameters may filter out the correct offsets or RAID layouts. You can expand the results displayed by decreasing the "Offset search performance" and "RAID layout search performance" parameters by moving the slider toward the "fast" setting. In the figure below, the default settings were used, and no offsets were detected. After decreasing the "Offset search performance" parameter in the Advanced Options pane and detecting again, the correct offset is found. Similarly, the "RAID layouts search performance" parameter can be decreased to find more RAID layouts. Note that the default settings should be attempted first. For less complex RAID layouts, decreasing either of these settings will display too many results, making determining the correct layout more time consuming. This may help when the RAID data is damaged to the point that none of the above steps yield successful results. Starting with the offset with the highest number of hits, manually select the offset and repeat the detection. Then, manually select a RAID layout with the highest probability. Continue this process of elimination until the correct RAID parameters are found. Recovering data from a failed RAID is a challenge. Detecting the correct RAID parameters is key to a successful recovery. The absolute best case scenario is one where the previous RAID configuration was stored or recorded prior to the crash. Barring that, using R-Studio's built-in automatic RAID parameter detection technology is the next best course of action. 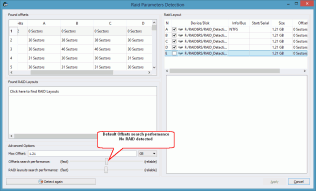 R-Studio's automatic RAID parameter detection works with very high reliability for simple cases, and for more complex situations, can be used as a powerful tool for determining the correct RAID offset and RAID layout.